Interior design is a flourishing business which has created a vast scope for the talented and creative interior designers to prove themselves. 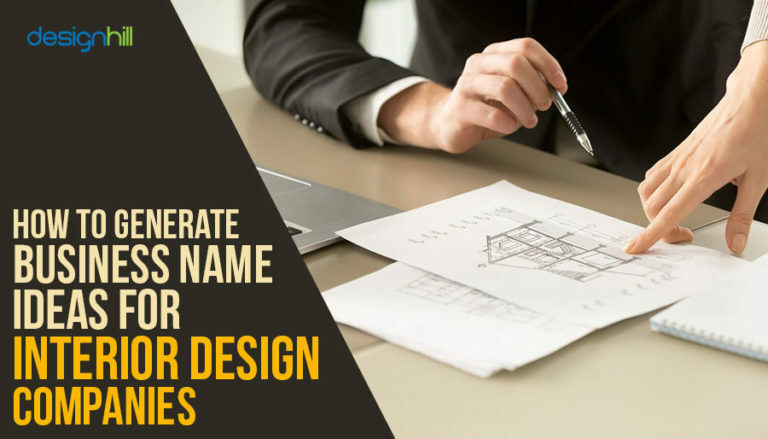 As you plan towards kick-starting your brand new interior design company, make sure to spend ample amount of time and energy into deciding upon a great name. After all, in today’s world, the saying goes, “What’s not in a name?” In times where brand image and brand equity rule the industry, interior design companies with a weak business name suffer drastically. When it comes to services such as interior design, clients prefer choosing a company with either a strong brand identity or strong recommendations. For companies which have just started and are still in the process of building their brand, recommendations prove to be extremely crucial. Let’s say that you are on top of your game when it comes to delivering the best interior design concept and your clients are delighted. But they can’t seem to recall your company’s name when asked or maybe it is spelled in a peculiar way so that new prospective clients can’t locate you on the internet even after hearing your name. This can result in not only loss of potential leads but also deter your branding strategies. Therefore as you prepare to launch your interior design agency, consider the following steps to generate a great name for your business as well as graphic design ideas for your own company’s logo. To remain ahead of your competitors in a competitive interior design business, it is important to pick an attention-grabbing name of your new company. We came out with our own list of unique company names. When it comes any business or services, the clients do matter. Consider the people you can envision hiring you and they become your target audience. Alluring logo can also work to attract onlookers. So get your logo designed only by a professional logo designer. Are they middle-aged families looking for a complete homely look, or are they young professionals expecting minimalist and chic look and so on. A company’s entire branding strategy is based on the intended audience, hence making it more critical for the business name to be engaging and memorable for the audience. It’s not only about the business, but also the people you wish to connect with. Each interior designer has his/her design style which decides their forte. People, who are looking for interiors in the said forte, become your audience. Once you have identified your audience, focus on the words that have a potential to be memorable and result in maximum impact. Looking for an interior design logo? A business owner must always keep an eye on the prize at all stages. While your goal at the moment might be to make it as the interior design company, think about your futuristic goals. As time passes and your company becomes successful, you may plan to enter the retail space dealing with home accessories. Over the years, you may plan to open up more branches or set up franchises. Therefore the company name must not include a location name or person’s name for respective cases. A business name that stays true to future expansions is always the best choice. In case your long-term goals are already a part of the entire strategy, it can help you zero in on a suitable name; otherwise, it is prudent to keep a name that keeps your options open. For instance, many home improvement companies aim at growing into a brand dealing furniture, once they build a name for themselves. Hence such companies decide upon a name which can be later relevant for furniture business and furniture logo as well. Some names stand out while staying relevant to the interior design industry. One of the popular factors in these names is the use of words which help the prospective clients make a connection. Nobody knows your company and its vision more than you. Until and unless you believe that the name does justice to your dreams for the business, it won’t work. The key is to make sure that you are not only looking for words which add weight to the name, but also with which you can relate to. After all, this business name will form a foundation for your company’s identity. This name should sing for you for it to be in line with the personality you would be breathing into the company. Consult and read books written by people who have built empires from the ground up. These may strike inspiration for you to look for a meaningful name yourself. Once you have compiled a list of great relevant words, start brainstorming and creating different combinations. Do not discard any of the combinations or words just yet. Form a comprehensive list where you have all the combinations. Try mixing up some of these combinations to come up with new potential name options. While this exercise can appear to be tedious, it is crucial in creating something unique and original. Don’t be afraid to play up and experiment at this stage. Keep in mind that no idea is a bad idea at this step. Make sure to include some keywords as part of the combinations as well, and this can help boost your SEO efforts while marketing. One of the main factors which establish the effectiveness of a business name is its originality. A business name that is original and distinctive can boost a company’s memorability; while helping it to stand out amongst the crowd. A great one of a kind name also helps the logo designer in creating some spectacular mockups for interior design logos, making the task of logo design a little easier. Now you may end up with numerous potential names at the end of the last step. This is where we remove the names which did not cut. It may seem a dreary, but this step is critical in determining which potential names are to be left out. Pick the best five names from the entire list from your exhaustive list of potential names. Any lesser than five would make it hard to decide which name sounds better and any more than five can lead to conflicting outcomes. A great way to shortlist these names is by including your staff in the process. A company’s workforce drives its operations and proves to be a substantial factor for success. Including them in your decision promotes a sense of belonging and partnership forging loyalty from the get-go. As you achieve a list of five finalized names, run these names through your trusted circle of friends or colleagues. Ask for their honest opinions and if possible, get them to share detailed feedback with you about each of these five names. To quantify the feedback each name receives, you can have them rate from one to five; another option would be asking them to fill out a feedback form and including questions such as impressionability of the name, how original did each name sound, whether the names easy to pronounce, etc. You can also use both methods together to get a more extensive picture of how each name finalist performs. Before going ahead and making your decision regarding the business name final, take a step back at this last and final stage and check the name for any red flags. Put each word under the microscopic inspection to avoid any issues down the line. Make sure that no other companies, trade unions, shops or associations have the same name. Even if some other business operating in a different industry is using the name, it can raise trademark concerns. Check if the domain name with the same spelling and exact name is available. Some interior design companies, when based out of a specific location opt for the country TLD such as .ca, .au, .in, .hk etc, if .com is unavailable. In such cases, it becomes imperative to check that the website hosted over the .com address does not contain any malicious or confusing content. You can check domain name availability at Name.com. Once the domain availability is checked, remember to look for relevant social media handles as well. A great brand is consistent, and therefore it is vital to have the same domain and social media handles. You should seek help of a skilled designer to create home improvement logo, if you don’t have in-house designers. After checking for all the red flags, you would have a clear winner for your business name. Now, you can go ahead with the documentation to get the name registered followed by purchasing the domain name. At this stage, you can also start with the branding process with hiring a professional graphic designer to design your logo, business cards, web banners, and other marketing content. You can also opt for AI-based online tools for graphic design services to save on cost. When you look for some great word combinations for a business name, it may seem easier to get sidelined in your view of things. Names and brands are subjective, and everyone perceives them differently. As you experiment with various combinations, make sure to keep in mind these tips so that you can be creative while staying within the necessary guidelines of a good business name. Homophone words are the words which have similar pronunciation with different spelling and meaning associated with them such as Carat-Carrot, Born-Borne, Made-Maid, Wood-Would, and so on. In an attempt to be clear do not compromise on clarity. Avoid the use of such words as they can throw-off someone looking for your business online. As you venture on your business journey, everyone would have a piece of advise for you especially when it comes to business names. While the urge may be sound, in the end, it’s your call. Make sure you keep an open mind to all the suggestions pouring in, give them a thought and accept the ones that seem sensible to you. 03. Choose A Name Which Is Clear And An Easy To Pronounce. You may be looking for distinct words in your business name to help it stand out, but this should not mean a name which is hard for people to read, pronounce or interpret. This can disconnect from your intended audience, leaving the entire exercise vain. While you may end up with a unique, pronounceable and memorable business name for your interior design company, make sure it is not devoid of words which convey the purpose of services offered. If such words such as interior, home, spaces, etc. help people connect the business with the interior design industry, making it easier for them to remember. Research the names that have been a success and the reasons. Which words hold top search ranks and how you can include them in your business name? Look for words and names already in use by other companies in real estate, home improvement, home staging, and interior design and try to steer clear from them to avoid confusion. If at any point, you believe the process has hit a wall, consider consulting a marketing or branding expert. Professional branding experts can share unique insight or ideas which can help you come up with some great business names. You can also hire a copywriter to help you navigate this forbidding task. Looking for a name that would be your company’s identity can be a nerve-racking task, but it is a crucial task nevertheless. Many companies end up spending a lot of money to rebrand themselves. You can save on the makeover costs later. The key is to remember that the time and energy if well spent now would make sure that you do it right the first time itself. It’s also imperative to have user-friendly design of your site, logo design and so forth to get success. However, there are some companies like Designhill that offer free of cost graphic design services.